In no particular order, my first must have WordPress plugin is User Role Editor. This is a very useful plugin if you run a blog with multiple users, as it allows you to change account type (e.g. contributor, author etc.) privileges, and even create whole new types of account. A great example of when I have used this plugin is when Matt has been helping me with some ‘behind the scenes’ coding. I needed help to fix some bugs, so I created a new user account type called ‘Matt’. I then changed Matt’s account from ‘contributor’ status to ‘Matt’ status. Matt was then able to fiddle around with the plugins and blog code, whilst not being able to change any comments, posts or pages. When he was finished, I changed his privileges back to ‘contributor’. CommentLuv is a really great plugin which enables you to give a little bit extra back to your commenters, by giving them a link back to one of their most recent posts at the end of each comment. I have written about CommentLuv before, so I don’t intend to go into any depth about it here. If you want to know more check out my post on why you should use CommentLuv. Growmap Anti Spambot Plugin (or as it is also know, GASP) is one of the very best plugins you can use to combat spam. Here at Technology Bloggers we get hundreds of comments every month, but I am sure that we would get thousands more if we didn’t have such a good spam filter. Of the comments that we get I would estimate that around 10% are spam. If Technology Bloggers stopped using Akismet and and GASP, then I think we would see our comments double, but the extra ones would all be spam. GASP places the tickbox (or checkbox for my American friends) that you see underneath the comment box. Logged in users need not worry about this, but users who are not logged in will need to make sure that they tick this box (and they will be prompted if they don’t) in order to make sure that their comment is approved. Akismet then helps us out by throwing any user written/generated potentially spammy comments into the spam folder. We can review these and it is then much easier to sift through and fish out any good comments which may have got caught up. Akismet is good, and very useful, but if you really want to stop spam, I would always make sure you have GASP. I have written an article about ReplyMe before, giving an explanation of what it does, who uses it and why it is useful. To briefly sum it up it is a plugin which sends commenters an email when someone replies to their comment, helping to improve the blog’s community. For more information please check out our ReplyMe article. Some themes present trackbacks just the way you want them to, other themes unfortunately don’t. The way I like trackbacks is the post title linked to the article that sits amongst the comments. Our current theme shows some text from the article too, which can look good, but often doesn’t. Prettier Trackbacks displays trackbacks the way I like them, and with a bit of editing/tweaking, you can make it show them just about anyway you want! 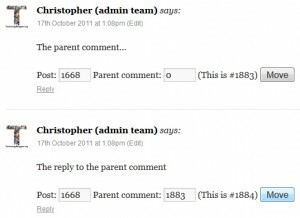 The next plugin on my list is Move WordPress Comments. Have you ever had someone comment in reply to someone else, but they forgot to hit the reply button, or have you ever done it yourself? If the answer is yes, then this plugin is a very useful one indeed! What the Move WordPress Comments plugin does is put a few extra details an options below comments in the dashboard and on the blog. These details are the comment’s number, the post number and the parent comment’s number. If the commenter has published their comment on the wrong post, just simply change the post number and click ‘move’ and the comment will shoot off to the correct post. 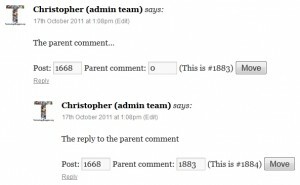 If the commenter has published the comment in reply to someone, but hasn’t joined the comment to the parent comment, then all you need to do is scroll up to the parent comment and find out what number it is. 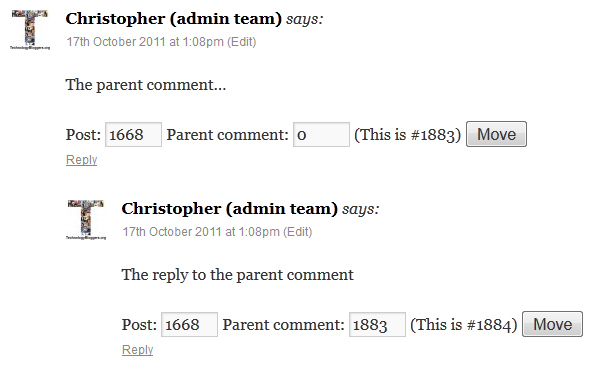 You then take the parent comment’s number, put it in the reply/child comment’s ‘parent comment’ box and click move. Et voilà! 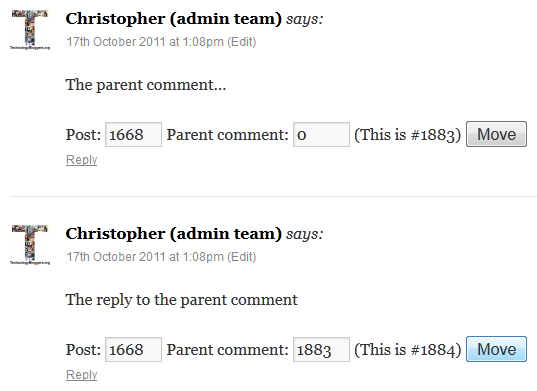 The reply comment is now threaded under the parent comment! Digg Digg is a really great plugin if you like to make your blog ‘social media friendly’! At the top of every article Technology Bloggers displays Google +, LinkedIn, Twitter and Facebook buttons, so that you can easily share our content. This is all thanks to Digg Digg which gives you more social media buttons and options than you could shake a stick at! If you want to create a social media friendly blog, Digg Digg is one of the best plugins out there! 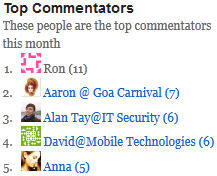 WordPress’s Top Commentators Widget is definitely one of the best plugins I have ever installed. It gives you the ability to thank your commenters by adding a widget to the sidebar (or in our case the footer navigation) of your blog, which displays your site’s top commenters, however you like! It has loads of easy to customise options. You can choose how many commenters get shown, how long names can be before they are replaced with an ellipsis. You can also choose if names are hyperlinked, show the individuals Gravatar, how big that avatar is, whether an award icon is shown by commenters with more than a certain number of comments, how often the list refreshes, etc. Listed above are some of the very best plugins I have ever used. Despite this, there are many other great plugins that I haven’t included, for fear of making this article university paper length! Lets save them for another time. So, what plugins do you use? Why do you like them? Are you going to try any of the plugins above? Do any of them look interesting/useful? I’ve been blogging for over two years now. It’s been a fun experiment, spending hours pouring into long-winded pieces of prose, carefully editing each word to pull out just the right meaning, and finally clicking the magic publish button… just to have it be read by a total of 3 people (which usually includes both my mom and my mother-in-law). There’s nothing the matter with blogging. It’s a mighty fine platform for building an audience, spreading the word, and making a difference. But sometimes I wonder if there’s not something more. TechCrunch recently reported on the insane exponential growth of Tumblr, a microblogging service that is now getting close to 8 billion page views a month. A tumblelog is a quick and dirty stream of consciousness…They remind me of an older style of blogging, back when people did sites by hand, before Movable Type made post titles all but mandatory, blog entries turned into short magazine articles, and posts belonged to a conversation distributed throughout the entire blogosphere. Aha! With just these few astute observations, a new picture starts to emerge. Blogging in many ways has formalized. It’s good for long thoughts, deeper ideas, but in measurable ways it has quietly crystallized into a rigid and imposing system. Popular blogging services like WordPress force you to come up with a title for every post, no ‘ifs’, ‘ands’, or ‘buts’. And if you don’t choose a category, you’ll end up with the silly looking “uncategorized” label gracing your posts. Whether you like it or not, there are stringent rules to follow if you want to play the game on their service. And after all, the search engines are hungry to index your posts and make them easily digestible for the web, so why not fall in line? Trackbacks automatically organize incoming links. Sidebars run down the right side of the site. Subscriber counts brag the latest stats. “Follow Me On Twitter” banners scream for attention. What started out as an experimental ecosystem has turned into a fairly well-governed digital edifice. And in the meanwhile, the abundant room for free thinkers and self-expression slowly diminishes. Most days bloggers write nothing at all because the sheer pressure of creating a masterpiece of a post is just too overwhelming. But on Twitter, one snarky tweet can say it all with less. You can write two sentences on your tumblelog and no one will be bothered. There is a freedom to do whatever you darn feel like doing. On Tumblr if you just want to post a picture that connects with your inner self on some deep emotional and unexplainable level, you just do it. If you want to reblog a different Mark Twain quote every day, you have permission.There are no rules. You don’t even have to name your microblog. Many times I’ve run into a very neat tumblelog only to be shocked that it’s completely anonymous. No descriptions, no user image, no advertisements, just a stream of short poignant content. Despite the benefits and freedom of expression granted by microblogging, the chances of changing the world (or making a profit) are much slimmer than regular blogging. The reason is the power of a well developed idea. context to tell the whole story. How many times have you seen a quote taken out of context? That’s the fundamental risk of ultra-distilled micro-ideas. You aren’t quite saying enough for people to get what you mean. Traditional blogging has the potential to unlock a deeper meaning that cannot be conveyed by separate smaller units. Bloggers have helped create a new brand of citizen journalism that is shaking traditional forms of media. Aspiring authors have garnered the attention of big publishers and earned book deals by attracting a large fan base through their blog. Blogs can do all those things for which microblogs are much less suited. Although some Twitter users have made a name for their self and or participated in highly significant events (like the raid on Osama Bin Laden), microblogging still has a long way to go in terms of impact. However more and more people are turning to microblogging to reach new audiences. By now every company uses Twitter, but more and more like Mashable, the New York Times, and Huggies are leaping head first into Tumblr as well. So which platform is better? You tell me. I’m going to reblog Mark Twain quotes now.